We don't typically work on cars in the office showroom, but this one was so clean we can get away with it. Here's the new transmission in place. 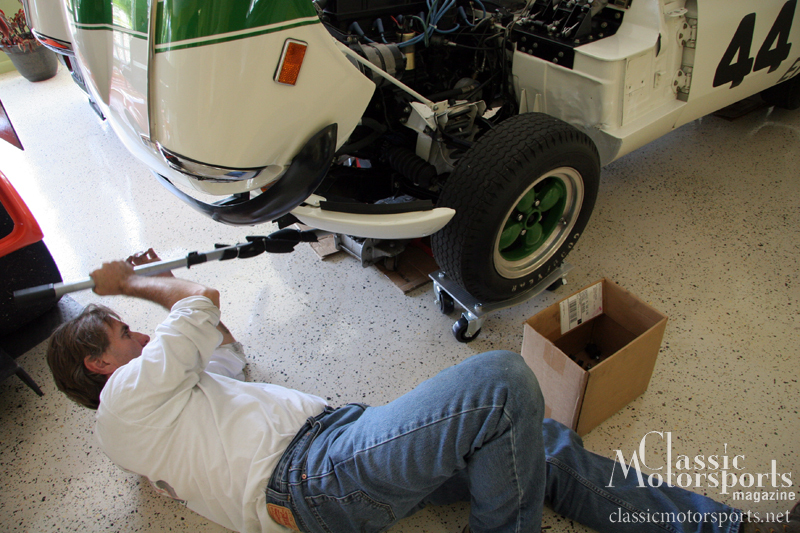 Our Triumph expert, Gary Hunter, has performed this changeover before. He's gotten downright good at it. The trickiest part of doing heavy work in the office showroom is the working around the other cars on display. We’ve always been believers that an ounce of prevention is worth a pound of cure; the problem here is that the GT6 transmission is decidedly heavier than an ounce. 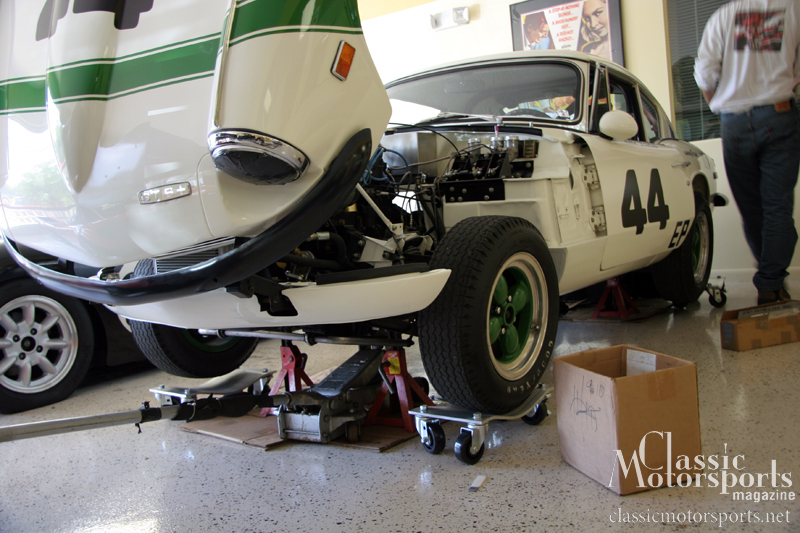 Last year, we had a little trouble with the transmission in our Group 44 GT6. Although we thought we had resolved it last time, an autocross with the Vintage Triumph Register at Jekyll Island left us wondering. We’ve always been believers that an ounce of prevention is worth a pound of cure; the problem here is that the GT6 transmission is decidedly heavier than an ounce. 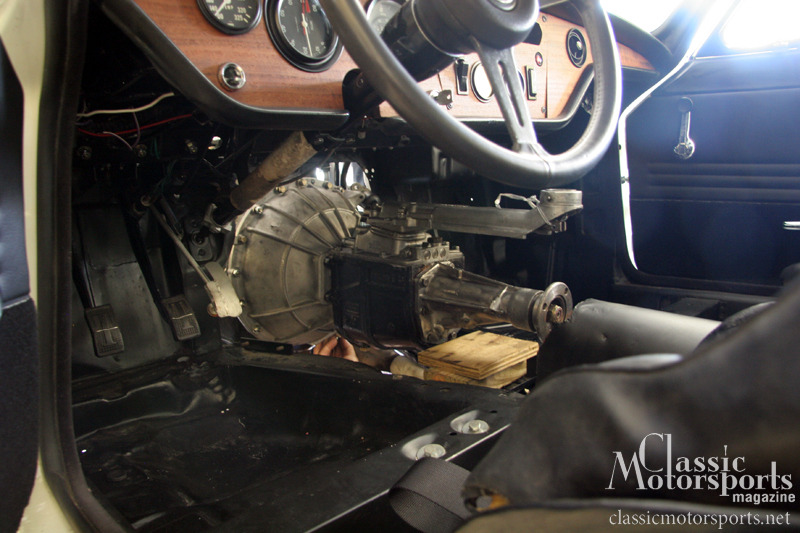 However, seeing as the original Group 44 team replaced and rebuilt these transmissions between almost every race, (increased power on an already maxed-out gearbox can have that effect) we took our 4-speed back out and tore it down again. Just in time for the Lake Mirror Classic, we’ve got our freshened gearbox back in the car. Group 44 head Bob Tullius will be the honorary chairman for the Lake Mirror event, so we couldn’t risk having an embarrassing failure in front of the car’s original owner. If you’re in the central Florida area this weekend, consider coming out to take part in this fantastic event. We’ll have the GT6 on display among a gorgeous collection of other Group 44 racers, and the rest of the show promises to be equally appealing to automobile fans of any stripe. We hope to see you there! I didn't run into you guys at Lake Mirror, but did see your car. It looked great. C-O-N-C-O-U-R-S. think like you're "adding lightness" to the word "concourse" by dropping the "e."